Try Our Keyword Analyzer Tools FREE! Keyword Analyzer Tools from WordStream greatly improve the performance of your search campaign while simultaneously saving you time. Keywords are the foundation of search engine marketing; your search campaign is only as strong as its keywords. However, you need to analyze keywords frequently in order to profit from their data, and this takes time. WordStream was created to maximize the benefits of keyword analysis without the time commitment. In this tutorial, we'll show you how to automate your keyword analysis in order to achieve the results without sacrificing valuable time. WordStream's Keyword Analyzer Tools work together to automate the tedious and repetitive tasks commonly associated with analyzing keywords so you can efficiently capitalize on keyword data. This automation is continuous and dynamic, so you can always be assured that your data is current and accurate. WordStream automates keyword grouping by analyzing a keyword, its visits generated and popularity, and suggesting proper segmentations. This relevant segmentation improves Quality Score and ensures your time is spent on the most important keywords you've found. Above, you see segment suggestions for an online pet store. Keywords can be sorted by visits generated, popularity, or relevance (a weighted average of visits and popularity). WordStream has analyzed all your keywords and grouped them into relevant segments with the click of a button. WordStream records every search query that results in a visit to your website and adds the keywords to your WordStream keyword database. As they come in, keywords are immediately analyzed and sorted according to the rules you've defined, and the visit counts of existing keywords are updated. Keyword discovery and keyword analysis happen automatically every day, literally growing your keyword list and updating keyword data as you sleep. These new keywords are a crucial way to discover new markets and to eye trends, which you can apply to all aspects of your business. This also works to continuously grow your list of long tail keywords, uncovering less competitive search terms with higher conversion rates. With WordStream's keyword source analyzer feature, you can perform source-level keyword analysis. Focus on just paid, just organic, or just suggested keywords and their associated traffic estimates, or analyze and act on all your keywords in aggregate. Negative keywords are imperative in order to reduce unnecessary spend and increase ROI. WordStream's Negative Keyword Tool examines your data and suggests negative keywords to help optimze your campaign for the best performance. With the software, you can find and apply negative terms in a matter of seconds. As new keywords flow in, terms you deemed to be negative are rejected automatically. 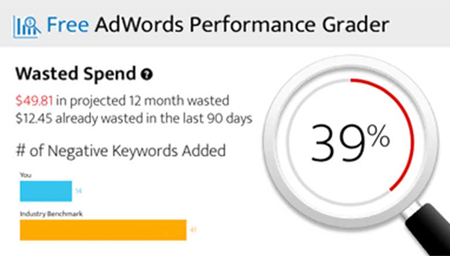 Why WordStream's Keyword Analyzer Tools? The goal of WordStream's Keyword Analyzer is to achieve the benefits of keyword analysis through time-saving automation. With these keyword analysis tools, it's easy to capitalize on keyword data--why not let the tool do your work for you?